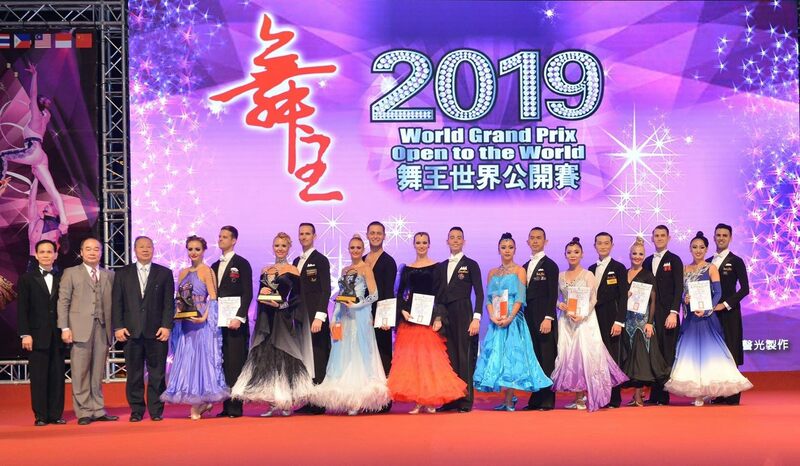 Co-organized by the Taipei City Government’s Department of Sports and Taiwan Dancesport Development Association (TDDA), the 2019 World Grand Prix - Open to the World dance competition is licensed by the International Dance Organization (IDO) and is also Taiwan’s only multi-disciplinary dance World Grand Prix. The spectacular event took place on March 30 and 31 at Taipei Arena and the basement theater of Taipei City Council. This has already been the 11th year that this competition has taken place at the Taipei Arena. Besides the world’s top 24 professional dancers, there are 400 pairs of contestants in total hailing from 30 countries in America, Europe, Australia and Asia. Modern dance world champions Mirko and Edita, world’s No.2 Latin dance couple Stefano and Daria, and world’s No.2 show dance couple Gerhard and Amor were also invited to participate at the grand spectacle this year. On the second day of the event, the competition moved to the basement theater at Taipei City Council, where dancer Seoyoung Park, representing South Korea in the world belly dance competition, wowed the crowd with stunning dance skills. Each year, the competition releases a special edition of World Grand Prix Charity EasyCard. To allow more children from disadvantaged families who show passion and talent in dancing to have the opportunity to attend international competitions abroad and make Taiwan proud, Project Hope for Tomorrow's Dance Kings, which has been a popular and successful event every year, has been launched again this year. Led by the Blackpool Dance Festival winner and ballroom dance world champion, this year’s campaign hopes to attract dance lovers and fans to collect a total of 4 different designs of World Grand Prix Charity EasyCard to make donations to Project Hope for Tomorrow's Dance Kings. Tsai Pei-lin, Deputy Commissioner of the Department of Sports, also attended the competition on March 30. Tsai said that sports participation needs support from more people, so encouragement of sports activities could have an even greater impact. He expressed his appreciation for the dedication and efforts put forth by TDDA in the last 11 years. The deputy commissioner was also delighted to see more and more people coming to Taipei Arena to take part in the event every year. After two days of exciting and incredible competitions, the Ballroom Dance World Grand Prix – Latin Dance champion title was claimed by Vitaly Sevastijanov and Anna Lisova from the U.K.; the title of World Grand Prix – Modern Dance champions went to Diego Arias Prado and Ekaterina Ermolina from Spain. In the Belly Dance category, Seoyoung Park from South Korea won the championship at Solo Grand Prix, while Taiwan’s Chen Chiao-hsin reached first place in Solo Adult Open Group 1. Taiwan’s Tsai Pei-hsuan took first place in Solo Adult Open Group 2; and the top honor of Group Dance - Prop & Fusion goes to Taiwan’s Charm’s. Other dancers representing Taiwan also achieved impressive results. In ballroom dance category, Chen Chien-shen and Chen Yen-chun, Yeh Chia-lin and Sun Chi successfully entered the World Grand Prix Standard – Modern Dance final, and reached 5th and 6th place respectively. In addition, the team formed by Wang Chun-yen and Hao Chen-ju also entered the World Grand Prix – Latin Dance final with the ranking of 7th place; and Tseng Yu-ting took 2nd place in Belly Dance Solo Grand Prix. All Taiwanese participants have given stellar performances. Being one of Taiwan’s highest ranked world dance competitions, the 2019 World Grand Prix - Open to the World has once again invited world dance champions to perform in Taiwan. Every year the competition brought spectacular shows and attracted tens of thousands of dance enthusiasts to take part in the extravaganza. This year the thrilling games have again come to an end amidst cheers and applause. We now await the 2020 World Grand Prix to come to Taipei again on March 28 and 29 of next year, bringing us all together in Taipei for more breathtaking international dance competitions.